Former Tottenham Hotspur manager, Tim Sherwood claimed that Mesut Ozil has magic in his boots and is key to Arsenal finishing in the top 4 this season. 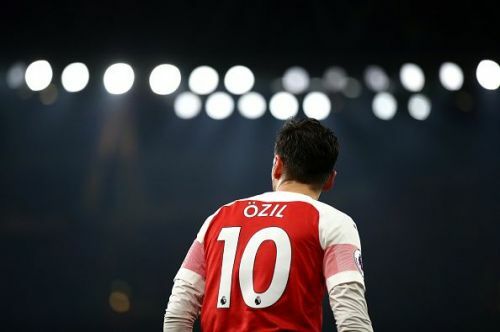 Despite playing a key role in Arsenal's 5-1 victory against Bournemouth during midweek, Ozil was again left out of the Gunners' starting-XI against Tottenham Hotspur. The German international is currently struggling for game time at the club and has started in just 14 of Arsenal's 29 league games this campaign. He was linked with a move away from the club during the January transfer window and could finally end his spell at the Emirates in the summer if his condition remains the same. Speaking to Sky Sports (via football.london), Tim Sherwood urged Unai Emery to start Ozil more often in order to strengthen their bid to qualify for the Champions League next season. “I guarantee you that Pochettino does not want to see Ozil’s name on the team sheet because he’s a threat and a potential match winner,”. “I know he does it when he wants to but you don’t pay someone £350K a week because he can run around. They have a lot of players who can just run around. After a 1-1 draw against Tottenham Hotspur at the Wembley Stadium, Arsenal will now go up against Rennes FC at the Roazhon Park in the first leg of their Europa League round-of-16 tie on March 7.